Chicago, Illinois, located squarely in the middle of the U.S. along the shores of Lake Michigan, is a vibrant, culturally-rich and architecturally-stunning city that is easily accessible from all domestic and international destinations. It is the largest and most-visited city in the Midwest. When one thinks of Chicago, cold weather often comes to mind, but that’s just what winter brings when there’s an average of 37” of snowfall annually. The other three seasons feature warmer temperatures, with cooler spots near the lake, and are inviting to both leisure and business travelers. Visitors and locals alike love Chicago for its diverse ethnic cuisine, whether it’s visiting Greektown, Little Italy for its handmade pastas and deep-dish pizzas or the Pilsen neighborhood for its Mexican specialties, or grabbing a Chicago-style hot dog at a nearby food cart. Named one of the Top 10 Cities for “Best in Travel” (Lonely Planet, 2014), there is plenty to do in Chicago, from shopping along The Magnificent Mile, Oak Street or State Street; visiting museums like the Shedd Aquarium, The Art Institute of Chicago, the Museum of Contemporary Art or the Adler Planetarium; attending Broadway shows, attending major sporting events; or simply spending time with friends in unique taverns, pubs, local breweries, chic lounges and wine bars that also dot the landscape. Tours of the city abound, with boat, walking, bus, trolley, “L” train, bike and Segway options available to highlight the towering skyline, historical architecture, colorful neighborhoods and first-class shopping. Chicago is a location-of-choice for millions of convention and meeting attendees each year. It is home to the largest convention center in the United State—McCormick Place—a state-of-the-art venue equipped with the latest technology and meeting-friendly services. Other top convention centers include: Navy Pier, The Tinley Center, the Donald E. Stephens Convention Center, AMA Chicago Executive Conference Center, The Conference Center at Willis Tower, Gleacher Center, River East Art Center, Summit Executive Centre, and The United Center. ETS is experienced in providing transportation management services for large meetings and events during all seasons, regardless of weather, and knows how to navigate the city as a result of planning successful transportation systems for numerous clients with Chicago-bound meetings. When planning transportation in Chicago, ETS is well aware of, and always ready to address and take advantage of the unique attributes of the city, while gracefully managing any last minute changes that might result from weather. Route planning – Many major events take place in Chicago—often occurring simultaneously— resulting in heavy pedestrian and vehicular traffic. ETS knows how to plan flexible routes for convention shuttle bus systems and take advantage of private roads to get attendees to their destinations faster and more efficiently. 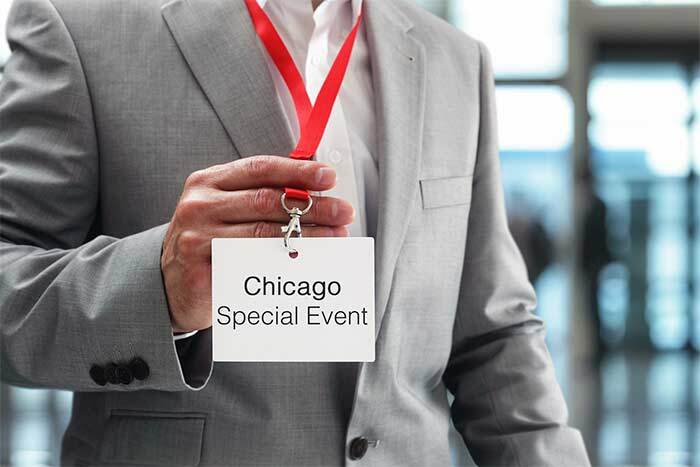 And, because it can often be challenging to select meeting accommodations when planning large events in Chicago, ETS also offers consulting to organizations to help them determine which hotels are ideal from a transportation-planning perspective. Embracing Green Initiatives – Chicago was among the first cities to be certified as a sustainable destination for events and meetings by the APEX-ASTM standard. It is one of the most environmentally-friendly cities in the world with its innovations in transit, water supply, waste management, and efficient use of energy sources. ETS is well-aware of these initiatives, ensuring that transportation planning adheres to any city environmental ordinances and involves the use of eco-friendly vehicles whenever possible. Special Event and VIP Transportation Planning – A plethora of unique event locations allow your attendees to mix and meet in landmark locations, historic museums, mansions, sporting arenas, galleries, outdoor, water, garden and rooftop venues. Included are the Field Museum, Wrigley Field, Promontory Point and Frank Lloyd Wright’s Robie House, among the many offerings that showcase what Chicago is all about. ETS has shuttled thousands of people to special events, and can also arrange for special events and tours to add to the attendee meeting experience. ETS also provides executive (VIP) transportation and airport transfers, and can help you coordinate and manage all your ground transportation needs. Sponsorship program support – Chicago is an ideal destination for transportation-related advertising, as long shuttle routes provide maximum exposure to attendees riding buses, and additional exposure to thousands of people on the city streets. ETS can provide shuttle banner advertising and convention TV programs to highlight exhibitor and association messaging during an event. For ground transportation services for meetings or conventions in Chicago, Event Transportation Systems is here to help. We understand how to navigate the Chicago city landscape, and can stay ahead of any unexpected events so you don’t have to worry about getting your meeting attendees to their destinations efficiently and on time. We encourage you to give us a call when you’re considering Chicago as your destination of choice. Event Transportation Systems provides shuttle, airport transfers, and ground transportation services.